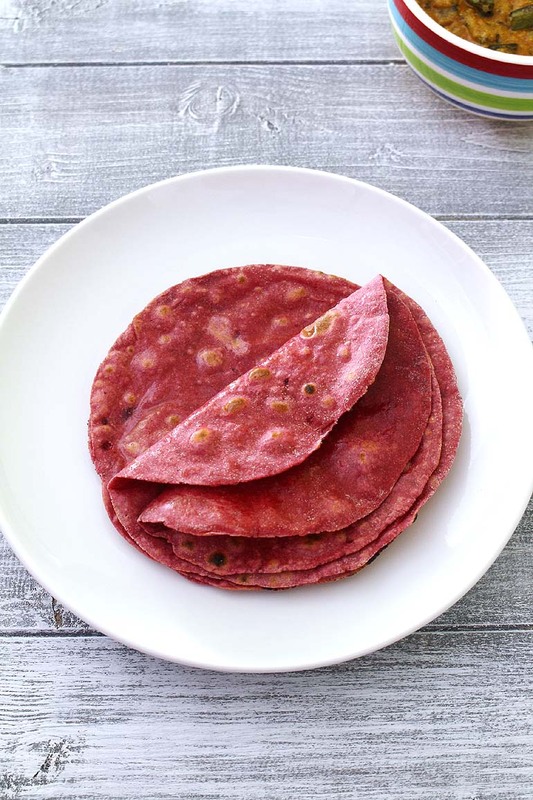 Beetroot roti recipe – these beautiful looking chapati are healthy and quick, easy to make. The beetroot puree is added while kneading the dough which gives the bright red color. These are perfect for kids or for those adults who do not like to eat this nutritious vegetable. Beetroot has earthy flavor that many do not like. By making beetroot chapati, that earthy flavor is not that noticeable. Of course kids will get attracted by its bright red color and they will happily eat them without any complain. For your fussy kid, you can stuff veggies inside and make roll. Because my husband is grew up in Jain family that do not consume root vegetables that much. So his palate is not used to with the taste of beetroot. But he likes actually loves this beetroot chapati. Why? Because the taste is not noticable. If you have someone in your family who refuse to have it in salad or sabzi then try this recipe. I am 100% sure they will like it. 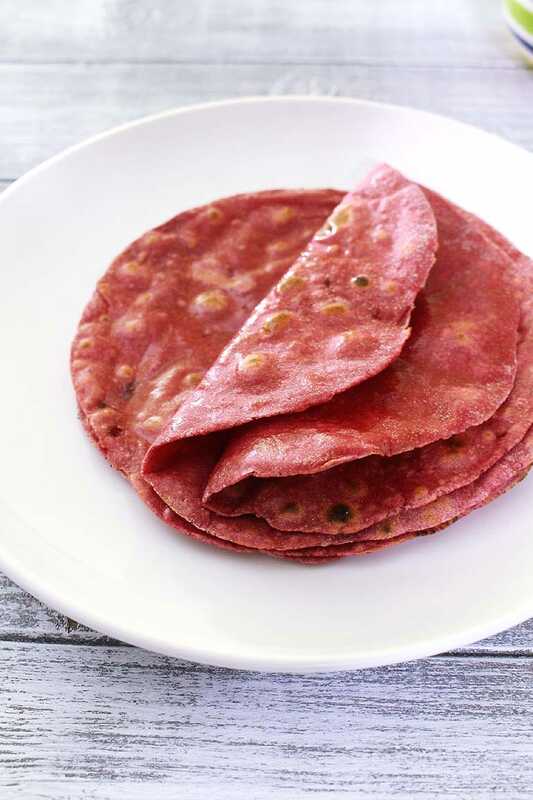 This beetroot roti is very easy and basic recipe. The method of making it is same as regular roti. The only difference is addition of puree into the dough. With this method you can make paratha too. Follow this masala paratha recipe as a base. Add puree to the paratha dough while kneading. Enjoy them with raita, yogurt or pickle as a breakfast. 1) First take chopped beetroot in a grinder jar and add 2 tablespoons of water. 2) Make smooth puree out of it and keep it aside. 3) In a bowl take whole wheat flour and salt. Mix well. 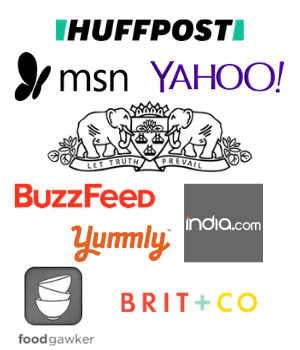 5) Mix using your fingertips. 6) Now add little water at a time and keep kneading till you get smooth and soft dough. For making it, I have added another 3 tablespoons of water. This quantity may vary depending on the flour quality and freshness. 7) Cover it and let it rest for 15 minutes. After that drizzle 1 teaspoon of oil and again knead 3-4 times to make it smooth. Divide it into 10 equal portions, make smooth balls and flatten between palm. 8) Take one flattened disc, dip into dry flour and put on the rolling board. 9) Start rolling till you get 6 inch diameter circle of even thickness. 10) Heat the tawa or pan on medium heat. Once hot place rolled chapati and cook for few seconds, you will notice few bubbles on top. 11) Flip it and cook another side for few seconds. Those bubbles will get bigger. 12) Now crank the heat to high, lift the tawa using handle and put it on back or side burner. Using tongs lift the roti and place directly on the flame. It will start to puff up immediately. 13) As soon as it puffs up completely, flip it. 14) And cook another side for few seconds only. Place on the plate, smear ghee on top. Similarly make rest of beetroot chapati. For detail tips for making perfect, puffed roti please check out the roti recipe. Serving suggestion: serve with any sabzi (e.g. bhindi fry, aloo palak, paneer jalfrezi) or curry (e.g. aloo matar, dahi bhindi, veg kadai, matar masala) or dal (e.g. dal fry, whole masoor, dal palak, chole). You can make kathi roll by stuffing different veggies inside for kids. 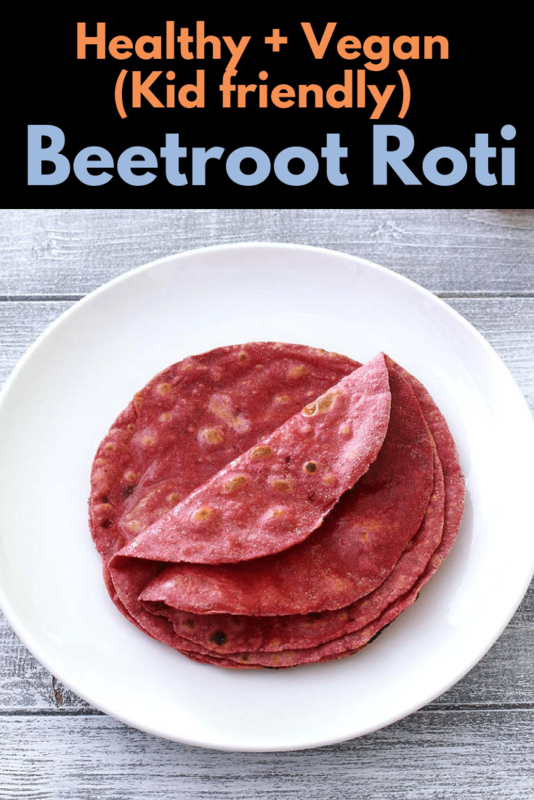 Beetroot Roti or Chapati Recipe - very healthy, vegan and kid friendly roti goes well with all the dry vegetables (Sabzi), gravy dishes (curries) and dal/beans recipes. Wash and peel the beetroot, finely chop or grate them. Take into grinder jar along with 2 tablespoons of water and make smooth puree. In a large bowl, mix atta and salt. Add prepared puree and mix using your fingertips. Now add little water at a time and keand into soft and smooth dough. Cover it and let it rest for 10 minutes. Drizzle a teaspoon of oil on the dough and knead it again to smooth out. Divide it into 10 equal portions and make smooth balls. Flatten them between your plam one by one. Take one flattened disc, dip both sides into the dry flour and roll into 6 inch diameter circle of even thickness. Heat the tawa or pan on medium heat. Once hot place rolled roti. After few seconds, as you see few bubbles flip it and cook other side same way. Then crank the heat to high, lift tawa and move to back/side burner and using tongs lift the roti and place directly on the flame. As soon as it puffs up, flip and cook for few seconds and remove it from the flame. Smear the ghee on top and repeat the same for rest.